I always find it extremely difficult to take my male kids to the butcher, as I have mentioned before. 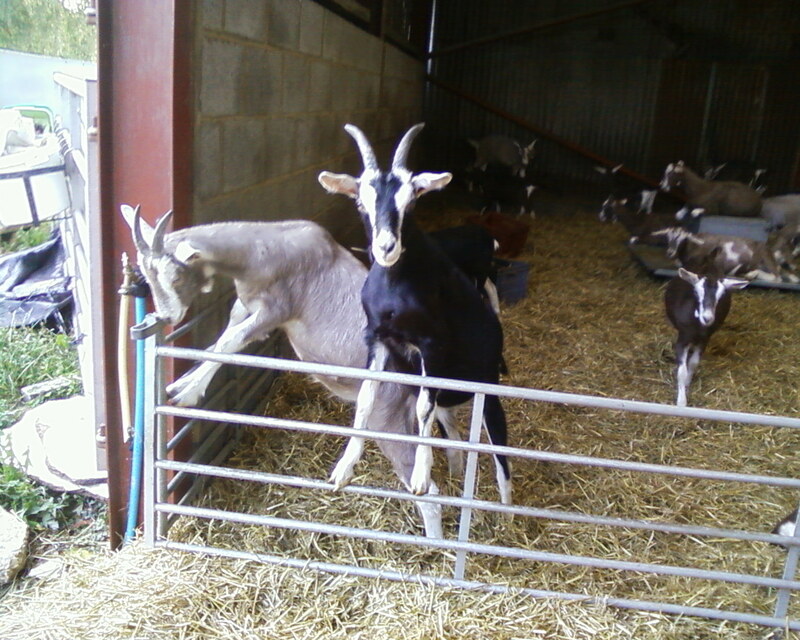 The worst part is having to choose who will go on a particular day and then carrying them out of the goat shed. All kids are special and all are beautiful (to me at least!) and, although we do not allow ourselves to have favourites, there are always a few each year who win a special place in your heart. It may be because they have a certain character or perhaps they have been unwell or needed some special attention when they were tiny babies, but for whatever reason, it is especially difficult when it is their turn to go. This morning was one such day as I had to take the last of my little British Alpine men. He was the black kid who, with his sister, jumped on top of the feeder and ran around in circles (see an earlier blog). He had a very characteristic face and strange little bleat and was a very sweet boy. My only consolation is that he had a very happy life and will be greatly appreciated by the customer who receives him. On a lighter note ... it would seem that Marmite cat has discovered a new favourite place to spend her afternoons. The window to my greenhouse is automatic and opens far enough in the sunshine for Marmite to scale the hedge and climb in. Once inside, she installs herself on the very top shelf of my wooden staging and snuggles down into a wooden trug to sleep away the afternoon in the sunshine. Her only problem is that she stays in there for so long that the sun goes in, the window closes and she can't get out again. So, when I come home in the dark from evening milking, I always have to open the door and let her out. It has become something of a routine now! And finally - the Gracie Moos. I haven't yet managed to get a close up picture of the new calves as mums are very protective. So, here's a picture of them taken from my bedroom window instead! Note the 4 small brown lumps in the field - 3 calves lying together and the youngest just behind his mother further to the right. She looks so cute (Marmite I mean) trust a cat to find the best, warm spot in the house (or greenhouse in this case)! Isn't it just typical of a cat?! Marmite also has a knack of homing in on the hot water bottle at bed time. She plonks herself right on top of it and there is no moving her. Many is the night I have had to climb into bed from the bottom or the wrong side, just to try and squeeze around a very possessive cat. The warmer the water bottle, the sharper the claws!